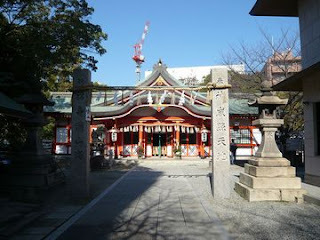 We visited a Tamatsukuri Inari shrine for Hatsumoude 1st Janualy! Hatsumōde is the first shrine visit of the New Year in Japan. Some people visit a Buddhist temple instead. Many visit on the first, second, or third day of the year as most are off work on those days. Generally, wishes for the new year are made, new o-mamori (charms or amulets) are bought, and the old ones are returned to the shrine so they can be burned. There are often long lines at major shrines throughout Japan. Most Japanese are off work from December 29 until January 3. It is during this time that the house is cleaned, debts are paid, friends and family are visited and gifts are exchanged. It would be customary to spend the early morning of New Year’s Day in domestic worship, followed by sake—often containing edible gold flakes – and special celebration food. During the hatsumōde, it is common for men to wear a full kimono—one of the rare chances to see them doing so across a year. The act of worship is generally quite brief and individual and may involve queuing at popular shrines. The o-mamori vary substantially in price. A common custom during hatsumōde is to buy a written oracle called omikuji. If your omikuji predicts bad luck you can tie it onto a tree on the shrine grounds, in the hope that its prediction will not come true. The omikuji goes into detail, and tells you how you will do in various areas in your life, such and business and love, for that year. Often a good-luck charm comes with the omikuji when you buy it, that will call good luck and money your way. You should visit a shrine, next year!